President Barack Obama has named Assistant Professor Sarah Bergbreiter (ME/ISR) as a recipient of the Presidential Early Career Award for Scientists and Engineers (PECASE). She is one of only 102 researchers nationwide this year to win the highest honor bestowed by the federal government on science and engineering professionals in the early stages of their independent research careers. "The impressive achievements of these early-stage scientists and engineers are promising indicators of even greater successes ahead," President Obama said. "We are grateful for their commitment to generating the scientific and technical advancements that will ensure America’s global leadership for many years to come." 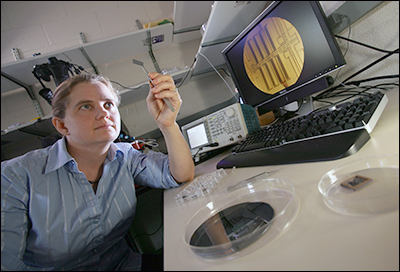 She has received the DARPA Young Faculty Award in 2008 for silicon/elastomer components for autonomous jumping microrobots and the NSF CAREER Award in 2011 for microrobot legs for fast locomotion over rough terrain. Bergbreiter currently is the PI for the NSF Research Experiences for Undergraduates Program in Miniature Robotics. Bergbreiter is joined by another ISR faculty member, Associate Professor Derek Paley (ME/ISR), in winning the PECASE award this year. Both Bergbreiter and Paley are associated with the Maryland Robotics Center. They will receive their awards in a White House ceremony in 2014. Three other ISR faculty, Elisabeth Smela (ME/ISR), S.K. Gupta (ME/ISR) and Don DeVoe (ME), won the PECASE in 2004, 2001 and 1999 respectively. All are also associated with the Maryland Robotics Center. Below, Dr. Bergbreiter explains her research focus in an ISR video. View more videos of her work on the Maryland Robotics Center's YouTube channel. Recipients are funded or employed by the National Science Foundation, Department of Defense, Department of Agriculture, Department of Commerce, Department of Education, Department of Energy, Department of Health and Human Services, Department of the Interior, Department of Veterans Affairs, Environmental Protection Agency, National Aeronautics and Space Administration, the Smithsonian Institution, and the intelligence community. These federal departments and agencies join together annually to nominate the most meritorious scientists and engineers whose early accomplishments show the greatest promise for assuring America’s preeminence in science and engineering and contributing to the awarding agencies' missions.